All BRUISER piping products are marked with the name CB Supplies as the manufacturer, BRUISER trade name, nominal size, design pressure and temperature ratings,relevant CSA and ASTM standard numbers, manufacturing date and production code, as well as the NSF-pw stamp indicating third-party certification by NSF International. NSF conducts random on-site inspections of CB Supplies manufacturing facilities and independently tests BRUISER piping and tubing products for compliance with physical and toxicological standards. CB Supplies offers BRUISER high-density polyethylene (PE 4710) manufactured by CB Supplies Ltd. for your most demanding water service applications. 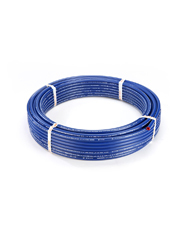 BRUISER Polyethylene tubing is durable, easy to install and corrosion resistant. Bruiser high-density polyethylene is available in 3/4″ – 2″ CTS sizes with a 200 psi rating in a variety of coil lengths. Bruiser PE is also offered in IPS sizes with a 160 or 200 psi rating. Bruiser PE is blue skinned, incrementally marked and indent printed for easy identification. The blue skin is UV stabilized and the black inner core adds additional UV protection for up to 5 years of outdoor exposure.